Honey is loved by many and bees are well known for it. But, it is also known that collecting honey from a beehive is not an easy task. When beekeepers collect honey they have to open up the hive, which can make bees a bit ‘grumpy’ because they think that a beekeeper is a threat. To protect the hive bees will try to sting the threat and scare it away. An attack of angry bees can range from the attack of a few guard bees to the attack of a whole swarm. A swarm of bees trying to sting you is not something you want to encounter. You have probably seen beekeepers working with hundreds of bees, and yet they rarely get stung. Their bees are so calm. How do they do it? Are beekeepers bee whisperers? It might seem that beekeepers have some special powers, but how they manage their bees is much simpler. They possess the knowledge of the honey bee biology and know how to use it to their advantage. If you are a beekeeper, being able to calm your bees is a valuable skill. We would even say that it’s a mandatory skill for any beekeeper. In this article, you will learn the triggers for bee aggression and how to calm bees. This valuable skill will make any work around the beehive a lot easier. Before we jump into how to calm bees, you need to know what triggers them. What makes bees defensive? Why are bees sometimes defensive? If you ever worked with bees, you might have noticed that honey bees are usually pretty calm. A defensive guard bee might have warned you, but the rest of the colony was usually docile. However, sometimes bees are angry and attack as soon as you come near them. What could be the problem? Grumpy bees are a nightmare for any beekeeper because they can make beekeeping work very difficult. Your protective bee suit can protect you from their stings but bees swarming around you isn’t enjoyable. Sometimes honey bees will chase you for just being within eyesight of the hive. In order to understand how to make the encounter with bees more enjoyable for you and the bees, you need to understand what makes them defensive. You might have already noticed that most colonies are not defensive all the time, so there must be some triggers which cause it. Many aspects of a bee colony are cyclic in nature, and aggression is no exception. Bees usually tend to be more defensive in late summer and early fall. The cause of higher aggression is that during this time there are more triggers. Learning what the triggers are can help you tremendously since you can know when to be more cautious, and can plan your work for a time when bees are less likely to be defensive. You cannot always predict how your bees will behave, but you can be wary of some triggers which could encourage defensive behavior. Predators lurking around the hive can make the bees more defensive and make their reaction to threats more vicious. Unfortunately, this is not always easy to discover. The predator might be a small animal active at night, so it can be hard to know about it. When you visit the bees during the day, everything can seem fine. But, the bees can still sense the predator and keep their guard up. For example, in summer skunks bring their family to the hive at night and attack the bees when they are cooling their hive. Since skunks are only sensitive to stings on their abdomens, they can sit outside the hive and eat bees one by one until they have had enough. In these situations your only option could be paying attention to the area around the hive. Possible predators could leave prints on the ground or feces. Every beekeeper knows that bees can get a bit cranky during hive inspections, which is not surprising. You would also be grumpy if someone came into your home and began poking around. However, sometimes inspections can be so stressful for the bees that they remain grumpy even a few days after it. To reduce the possibility of having cranky bees, you should choose the right time of day. The best time of day to work with bees is early morning to late afternoon. Have you noticed that you don’t feel like yourself when you are hungry? When it has been a while since you had your last meal you get annoyed easily and just want to be left alone. Well, honey bees are no different. If there is not enough food or water, bees are not happy. For every living creature food and water are essential for survival, and honey bees are no different. The lack of water or food can make the bees grumpy and can also be destructive for the colony if the beekeeper doesn’t notice it on time. If you want calm bees, make sure your bees have enough food and water. A queen has a significant influence on the colony; her temperament and personality pass over to the rest of the colony as well. If the queen’s temperament is bad, the colony might be hard to work with and might need re-queening. There is no sure sign that queen might make the colony bad, but if you have issues with your colony it is worth looking into it. You might just need a calm queen in your colony. A queen can go missing because of her death or some other event, which forces the colony to find a new queen. While the colony is getting a new queen, it can be more defensive and protective. This behavior will continue until a new queen has mated and the balance in the hive has been restored. An easy way to check if the queen is alright is to put your ear to the side of the hive and lightly tap the hive with your knuckles. In a hive with a healthy queen the colony will buzz for a few seconds and then calm down. Colonies without queen can keep buzzing for up to 30 seconds. Common knowledge among beekeepers is that honey bees prefer calm, sunny days. Those days are the best time for hive inspection because the bees will be calm and easier to manage. Opening the hive on cloudy, rainy, or windy days is not recommended because the bees will be more defensive. Rainy weather with heat and high humidity makes bees especially cranky. On those days bees have a hard time with cooling the hive and evaporating nectar, so it's not surprising that they are grumpy. Africanized bees are known for their aggressiveness, and their presence is usually not good news. Have you heard about killer bees and how aggressive they are? Well, they are so aggressive because they are Africanized. Now you can imagine how difficult it would be to handle a honey bee colony who's queen mated with Africanized drones. If you suspect that your hive has been Africanized, try to re-queen the hive with a mated queen. A bond between honey bees and flowers is unbreakable. Flowers are a source of nectar which is an integral part of bee food and flowers need bees for pollination. If there is a shortage of nectar sources, bees will be grumpy and use any way possible to ensure the survival of the colony. One of the drastic measures for getting nectar is stealing it from other colonies. Unfortunately, this makes both colonies aggressive. Robbing bees are aggressive in order to take the nectar, while robbed bees become highly defensive of their stores. The fight for resources causes a cloud of bees around the hive, and you can often find dead bees at the hive entrance. Genetics and external triggers may be the cause of bee defensiveness, but sometimes beekeepers themselves unknowingly encourage such behavior. If you are a beekeeper, then you know how important it is to remain calm during a hive inspection. Rushing while working and handling the bees roughly can make even the calmest colony aggressive. Also, loud noises around the hive could trigger the bees so try to keep the noise to a minimum. Moreover, some beekeepers put down their caution and work with the bees in inadequate clothing. Those who tried to check the bees in a sweater and with their hair exposed know how dangerous it can be. Bees can easily get stuck in your hair and clothing which can result in a lot of stings. When they get stuck in hair and clothing, bees might think that they are stuck in a spider web so they might be more prone to sting in such situations. Honey bees can only sting once, but they mark you with a pheromone which marks you as a threat to the hive. This encourages other bees to also sting you. Now you have learned what could be the cause of defensive bee colony, but that's not all. The next step is determining how to reduce the possibility of the triggers in order to keep your bees calm. How to keep your bees calm? There are some specific techniques which you can apply to reduce agitating the bees, but some things are not as obvious. If you are an experienced beekeeper you may already know some of the triggers, but we are sure that you are not aware of all the subtle triggers for bee defensiveness. We believe that being able to keep your bees calm is essential knowledge for any beekeeper. If you ever tried to work with defensive bees, we are sure that you will agree. To make everything more organized we grouped the tips and tricks into several categories. Let’s jump into it! # Don’t open up hives frequently. Like we already mentioned, opening a hive is stressful for the colony and makes the bees defensive. After such stressful event bees need some time to calm down. By opening the hive frequently that time is significantly reduced, so bees may get more and more defensive. Because of frequent stress, your bees might even start seeing you as a threat. Regular hive inspections are an important part of beekeeping but don’t overdo it. 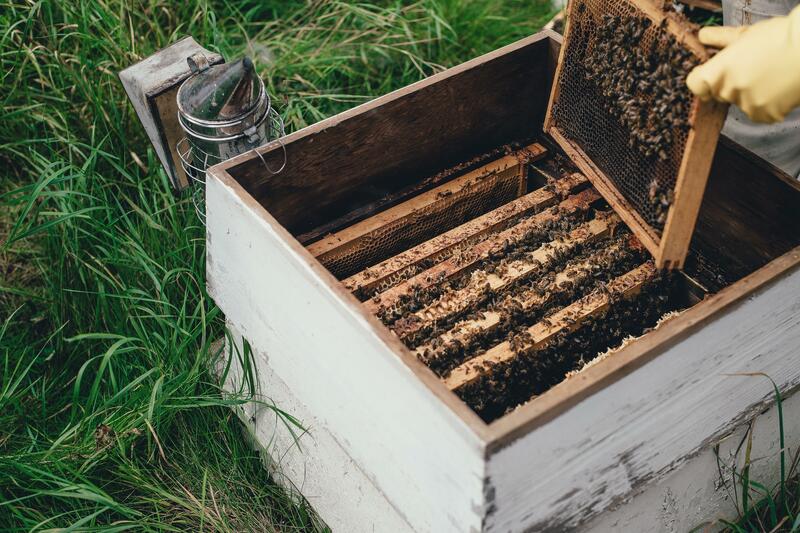 If you suspect that frequent inspections are the issue for your bee colony, we recommend consulting with an experienced beekeeper who can teach you how to monitor your bees without opening the hive too often. # Be calm and gentle when working with bees. Some caution is always required when working with honey bees. If you accidentally crush even a single bee, alarm pheromones from a crushed bee will mark you as a threat and trigger the bees to sting. # Avoid talking loudly near hives. Loud noises may alarm the guards and trigger an attack. Just be calm and your will have calm bees. # Wear proper clothing when working with bees. Unless you are allergic to bee venom, a bee sting may not seem that bad. But when you realize that bees can mark you with alarm pheromones and trigger an attack by hundreds of bees, you realize how important it is to wear a protective bee suit and head gear. If you need help with choosing a bee suit which suits your need, check here. It is of extreme importance to protect your face and head because there are many sensitive areas, such as your eyes and mouth. A sting on your face could leave you housebound for days because of swelling. Moreover, a sting to the neck or mouth can be life-threatening because the swelling could prevent you from breathing properly. Sometimes experienced beekeepers feel more comfortable without bee suit and choose to just wear protective head gear. They compensate for the lack of bee suit by wearing thick clothing and sealing any openings. Leaving any gaps enables the bees to crawl under your clothes and sting you. If you are a beginner, we definitely recommend wearing a bee suit. When you are inexperienced, accidents can happen easily. Both you and your bees benefit from you wearing protective gear because of calmer work when you don't have to worry about stings. A calm beekeeper also keeps his bees calm and makes the experience less stressful. If you are sensitive to bee venom, then wearing protective gear is very important. You know how people say, ‘better safe than sorry’. # Make a plan of what you want to do and prepare the necessary tools in advance. By organizing a bit while doing work with bees you can do the work quickly, so the bees are less likely to be agitated. # Try to stay out of bee line where bees are flying frequently. Stay out of their way and you are less likely to bump into bees which could trigger an attack. If you have calm bees, just let them do their own thing without interruptions. # Check for warning signs. Bees usually don’t attack out of the blue, there are some warning signs which reveal that you might be attacked. They often warn you by flying at your face and buzzing at a higher pitch. But sometimes the loudest buzzers are just drones. Drones don’t have a stinger, so they are harmless even though they seem scary because of their size. It would be a good idea to observe a hive and learn what a drone sounds like so you don’t mistake a drone passing by for buzzing as a warning sign. # Don’t wear bright clothing. Clothes with bright colors might make you interesting to honey bees. Remember, flowers are also brightly colored. Bees might think that you are a strange looking flower and may want to come closer to check it out. Curious bees are nothing dangerous, but you could accidentally trigger an attack since they will fly close to you. You could accidentally hit a bee or squash it which could trigger an attack because of released alarm pheromones. # Avoid sudden moves. Bees are exceptional, and one surprising thing about them is that they are sensitive to movement. If a bee starts diving at you and buzzing loudly, don’t swat at the bee since it might trigger an attack. What you can do is stay still for 20 - 30 seconds as the bees will most likely lose interest after that period. In case you don’t have protective gear we recommend to run away and stay still in shadows. # Choose the right time and weather conditions to open up the hive. Choosing the right time for opening hives is of great importance because it can reduce the defensiveness of the bees and their stress. The best time to open up a hive is after mid-morning because most of the foragers have left the hive by the time. With fewer bees in the hive there is a lesser possibility of angry bees. As far as weather is concerned, you should choose days when the weather is similar to the conditions in the hive. Avoid rainy, cloudy, and windy days as that could make your bees more grumpy. Bees might be cranky because opening the hive on those days exposes the inside of the hive to the wind, rain, and cold air. You should also avoid opening the hive when the rain is imminent because most of the honey bees will be in the hive. # Avoid placing hives in locations prone to frequent vibrations. Vibrations can affect the colony greatly and make it more grumpy, especially if the vibrations are constant. One source of vibration is all around us. It’s traffic. Cars passing by on the road might not seem like much to you, but they actually create quite a lot of vibrations in the ground. Some colonies might not mind the vibrations but some colonies are very annoyed by them. If your bees are close to the road and have gotten grumpy, the solution could be a simple relocation of the hives. # Pay attention to a sudden change in the behavior of your bees. If you have had your bees for a while, you most likely learned what is their normal behavior. If you notice a sudden change in their behavior, it could be stress related. Like we mentioned before honey robbing, wasp attacks, queen disappearance and starvation can cause a lot of stress in the colony. As a result, the bees can be grumpy or have low activity (in the case of starvation and queen disappearance). # Protect the bars you are not working on. Honey bees need the optimal temperature in the hive for honey production and raising brood. They work hard to keep the inside of their hive warm, so you can make their work a lot harder if the hive is opened up for too long. Open hive exposes the brood and the bees to cold air which is one thing you definitely want to avoid. If possible, use a cloth or some other barrier to cover the bars you are not working on. Also, avoid chilling the brood comb which can be recognized by a thick mat of bees covering it. # Sometimes bees calm down with time. Some beekeepers believe that their bees can recognize them and behave differently towards them than to the other people. If bees are able to recognize individual humans is up for speculation, but one theory says they can recognize us by smell. How your bees behave around you is probably dependant on the experience you had with them. If your actions make them stressed, your bees might see you as a threat and act defensively whenever you are around them. This issue can be a big problem, but for every problem there is a solution. In summertime, one method that can help you calm bees is to take advantage of a short life span of worker bees. Since worker bees only live about six weeks in summer, leaving your bees alone for a few weeks can reset their behavior to default. # If you need to move the bees from a hive, do it on a cool evening. Doing it at this time makes it easier because the bees are less inclined to fly around. Bees will just try to join the other bees in a warm box before it gets dark. However, this doesn’t mean that you can be reckless near a hive. Bees might be less inclined to leave the hive, but guard bees can still sense you. # Keep bananas and banana scented things away from the bees. We know that this may sound a bit crazy, but there is a very good reason why bees and bananas don’t go well together. Sense of smell is an important tool in bee communication and pheromones are often used in subtle communication. When bees detect a threat, they release an alarm pheromone which, weirdly enough, smells like bananas. You probably noticed that if you accidentally crush a bee or a bee stings you, the other bees follow and try to attack. Being swarmed by angry bees is a scary experience even for experienced beekeepers in full protective gear. You can imagine how terrible it would be to bring the smell of bananas around the bees and make them think they should attack. # Avoid strong smells like perfume. Honey bees are sensitive to changes in smells so any strong smell can be stressful for them and trigger an attack. # Don’t breathe or blow into the hive. Our breath has a particular smell which bees recognize as mammal breath. Unfortunately, bees see mammals as a threat because mammals often steal their honey. We all know the biggest animal honey eater - a bear. # Washing your beekeeping clothes regularly and using disposable gloves can reduce attacks. Like we already mentioned, bee attack is usually triggered because of an alarm pheromone. Angry bees will try to sting you and bump into you, and in the same time will release that pheromone which will attract even more bees. If you suspect that you are often marked by the pheromone, then clean clothes and gloves can help to calm bees. Working around the bees with the scent of their alarm pheromone will mark you as a target right away. Alarm pheromone can trigger even the calmest colony. Also, clean clothes and gloves to prevent the spread of diseases between colonies. # Wash off your sweat before opening hives. Bees have a strange behavior around our sweat. They love fresh sweat and will lick it off your skin if possible. Our fresh sweat is full of minerals so bees will drink a bit if given a chance. If you ever felt a bit of tickling while a bee was on your skin, you were probably licked by a little bee. However, for some reason honey bees don’t like stale sweat. If you plan on doing activities where you may sweat a lot, it would be a good idea to take a shower before visiting bees. # Masking alarm pheromones with smoke or peppermint can reduce attacks. Sometimes luck just isn’t on your side and you get stung. In that situation you need to pull out the sting as soon as possible and mask the pheromones to avoid further attacks. Honey bees won’t like whatever you use to mask the pheromones but it is a lot better than alarm pheromones. # Bee smoker is a fantastic tool, but don’t overdo it. Use just a few gentle puffs of smoke on top of the hive and at the entrance. Just to be safe, also puff some smoke on your clothes to mask alarm pheromones in case you have been tagged. Make sure that the smoke is not hot or acrid because it will hurt the bees. If your bees are especially feisty, you can try lavender smoke as it will calm bees even more. Smoker is a great tool for any beekeeper and we recommend getting it as soon as you start beekeeping. We have an amazing article on why smoker is the most used beekeeping tool, you can check it out here. It is easy to use so there is no reason not to get it. If you would like to learn about how to use a bee smoker effectively, you can get some info here. Smoke triggers a natural response in bees so there is no harm in using it and the bees go back to their usual stuff 10-20 minutes after you stop using a smoker. # Ask experienced beekeepers for the advice. You might be missing something that is triggering your bees, and an experienced beekeeper can be a great help with that. If you are a beginner, having an experienced beekeeper to turn to for info is valuable for everyday beekeeping activities. When you are not sure how to proceed, you can always ask them. If they let you observe their work with bees or even let you help them, you can learn a lot. # Requeen the colony. The queen bee greatly influences a bee colony. If the queen has a bad temper, that reflects on the behavior of the whole colony. Requeening requires killing the queen and bringing a new queen or letting the colony raise their own queen. If you are bringing the queen, then it would be a good idea to make sure you get a gentle queen in order to not repeat the initial issue. If you would also like to preserve local strains, then choose the second option (let the colony raise their queen). However, this method brings some risks. The new queen preserves half the vigorous genetics, so there is no guarantee that aggressiveness will be eliminated. Moreover, requeening will set your colony back several weeks so you won’t be able to reap the honey that year. In the worst case scenario, the new queen won’t mate and the colony dies. One thing you also have to remember is that it is possible that the queen is not the one carrying ‘hot’ genes. The culprit might be some drone who mated with the queen. # Give the colony to an experienced beekeeper with a remote apiary which is away from humans. If you feel that your defensive bees might be too much to handle, there is no shame in giving them to someone more experienced who can handle them. We know how hard it can be to have to give away your bees. But if you tried all you could and the issue still stays, then it’s worth giving it a try. Placing such colonies away from humans can be beneficial for them. It removes the danger that they pose to anyone passing close and gives them an opportunity to be productive without disturbances. Such strong and defensive colonies have no trouble with predators such as wasps so they can be quite successful. As a main element in beekeeping, honey bees have a significant impact on how beekeeping is done. Calm bees enable the beekeeper to calmly and patiently do all the required beekeeping work. Grumpy bees make everything harder and can give many headaches to beekeepers who are taking care of them. All beekeepers want the best for their bees, but some just can’t or don’t want to deal with grumpy bees whenever they try to do their work. Unfortunately, temperamental bees can even completely turn away people from beekeeping. Considering that the number of bees is declining, every new beekeeper is welcome. Beekeepers play a big part in protecting bees. Wild bees have a hard time surviving and are usually less successful than colonies kept by beekeepers. When working with bees, the aim is to be as quick as you can while keeping the bees calm and doing good work. Failing to calm bees repeatedly makes them stressed, which can affect their honey production and even the health of the colony. Because of this, we believe that you should learn how to recognize bee stress triggers and work towards keeping your bees calm and happy by reducing stress triggers. Spread the knowledge of calming bees with every beekeeper you know, even experienced beekeepers might learn something new! Happy beekeeping and bee happy!